A legacy of mining activities in the Lake Fork of the Gunnison watershed has left old mining and milling waste products that contain heavy metals which negatively affect the environment. Through various pathways these metal can contaminate water and soils. To reduce the effects of heavy metals on the environment, the LFVC has been working to remediate many of these sites. We do this work in partnership with local, state, and federal entities. 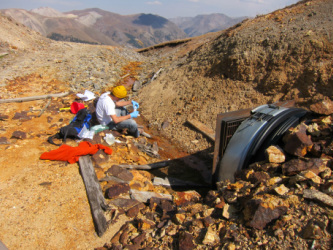 The Hough Mine is situated at 12,800 feet near the top of the east side of Engineer Pass, approximately 500 feet from the well traveled 4-wheel drive road. Check it out some time! The site consists of an open draining adit, a partially collapsed shaft, and two waste dumps that scatter debris over 7 acres. When you're up there, you will probably notice that the site is not only near the pass, but is also located in the headwaters of Palmetto Gulch. Palmetto Gulch feeds into Henson Creek and becomes the main tributary to the Lake Fork of the Gunnison River. Casey Carrigan, OSM/VISTA 2010-12, tests water in Palmetto Gulch. It's a no-brainer. Both Palmetto Gulch and Henson Creek have been listed on the 303(d) list of impaired waters (read: deemed polluted by Clean Water Act standards) for harmful levels of cadmium and zinc. The Hough is the largest man-made contributor of heavy metals to both of these water systems. Of 66 mine waste sites sampled in Henson Creek drainage in 2005, the Hough contributed 95 percent of metal loading from this type of source. In addition to contributing cadmium and zinc to the water supply, the site contributes substantial copper, lead, aluminum and arsenic. 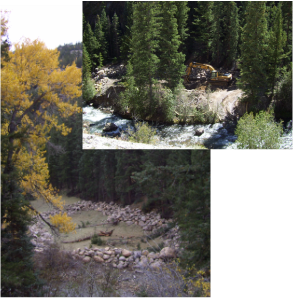 remediated (read: cleaned up), zinc and cadmium loading in Henson could be reduced to the point where Henson Creek could be removed from the 303(d) list! The Golden Fleece mine had a productive career. By 1904 it had produced $1,400,000 in silver and gold ore; total gold production from 1874 to 1919 totaled about $10 million. The mine is located 5 miles south of Lake City and approximately 0.8 miles west of the north end of Lake San Cristobal, which is the second largest natural lake in Colorado and a major recreational resource and drinking water supply lake in Hinsdale County. Acid mine drainage from the Golden Fleece Mine was contaminating the lake, potentially affecting the recreational tourism economy (fishing was a particular concern) and getting into Lake City's drinking water supply. The Ute-Ulay claims were formally located in 1874. Two years later, as Colorado gained statehood, the mine received its first influx of eastern investment when the Crooke Brothers bought the mine. Its economy tied to the mine, Lake City boomed as well, boasting a population of 4,000 downtown, and another 2,000 in the "suburbs" that year. It continued to produce in cycles of boom an bust for the next quarter century. Between 1874 and 1900, the Ute Ulay produced $12 million in silver and lead. 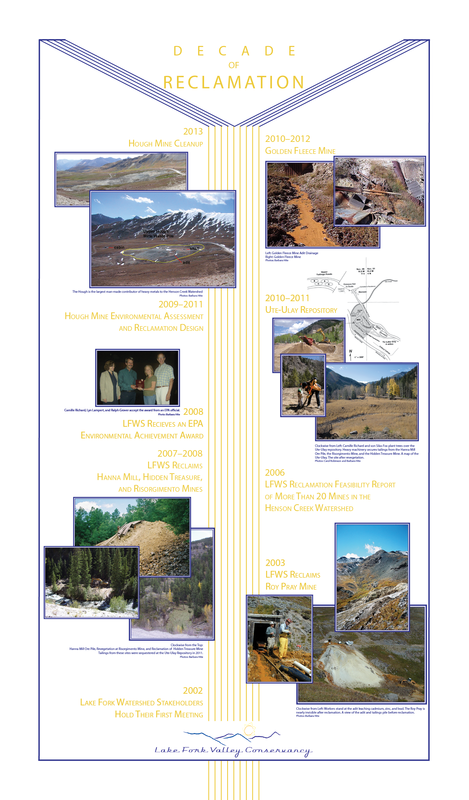 In 2009, the Bureau of Land Management, in partnership with the Division of Reclamation, Mining, and Safety, initiated a $1.2 million cleanup of the tailings piles above Henson Creek. 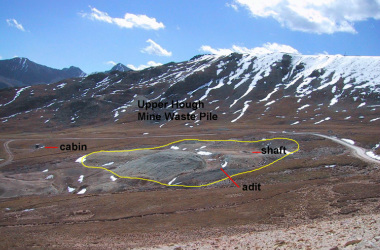 This reclamation included not only tailings from the Ute-Ulay, but from three other mine sites: the ore pile at Hanna Mill, the Risorgimento Mine, and the Hidden Treasure Mine. The Hanna Mill site is located in the Capitol City area, and contained two areas of concern. One consisted of 900 cubic yards of mine waste (particularly lead, as well as copper, zinc, and cadmium), located at the terminus of an areal tramway that transported ore from the mines above. 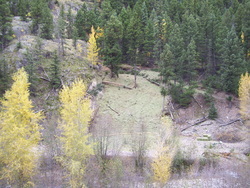 The other was a tailings pile along Henson Creek that washed into the waterway when rain and snow fell. Both were removed, and trucked to the Ute-Ulay Repository. This action was taken by the Bureau of Land Management, in partnership with the Division of Reclamation, Mining and Safety. The Risorgimento is located approximately three miles west of Lake City on Henson Creek, and consisted of an adit and a mine dump on public lands. After it was located in 1905 by Frank Potestio, the claim's history is sketchy. Potestio worked it until 1922, and in 1958 it produced gold, silver, lead, and zinc for Wellman and Long of Lake City. When the Bureau of Land Management assessed the site, they found levels of lead, copper, and zinc that would be detrimental to existing wildlife, and levels of arsenic that would be detrimental if human residents or workers occupied the site. 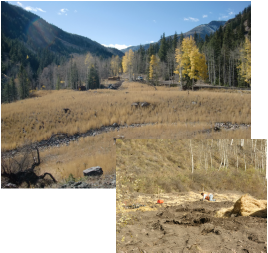 Again, the BLM partnered with the Division of Reclamation, Mining and Safety to clean up the area. The Hidden Treasure tailings sat at the mouth of Alpine Gulch, beside Henson Creek. The tailings were characterized by very high levels of lead and zinc. The Bureau of Land Management, with the Division of Reclamation, Mining and Safety, removed the tailings from this area and secured them in the Ute-Ulay Repository. The Roy Pray presides over the Palmetto Gulch watershed near the top of Engineer Pass on public lands (12,600 feet), and drains into Palmetto Gulch, which was put on the Colorado Department of Public Health and Environment's 303(d) list for cadmium and zinc contamination in 2004. 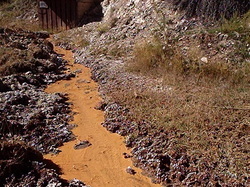 The acidic portal discharge from this abandoned silver mine is one of the largest loaders of metals to Palmetto Gulch, a sub-watershed of the Lake Fork of the Gunnison. These metals have almost totally eliminated macroinvertebrates in Palmetto Gulch. In 2001 and 2002, the Bureau of Land Management and the Division of Reclamation, Mining and Safety began a three-phase reclamation of the site. The first reclamation conducted in 2003 was the installation of a hydrologic bulkhead seal 80 feet inside the tunnel to prevent acid-mine discharge. In 2005 the Roy Pray mine waste pile was relocated out of a perennial drainage to an on-site repository constructed above the floodplain of Palmetto Gulch. 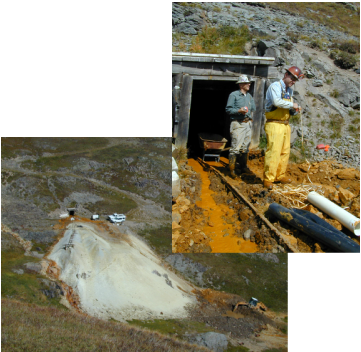 The final phase of work in 2007 involved capping the mine waste repository with a High Density Polyethylene (HDPE) liner system, placement of cover soils and talus rock, and revegetation of disturbed areas. The LFVC has cleaned up six mines since 2002, a feat that earned us an EPA Achievement Award in 2008. The Hough is lucky number seven! Acid mine drainage associated with hard rock mining throughout the Rocky Mountain region, is, as the name suggests, acidic and high in metal concentrations. It's also bright orange! Under the acidic conditions, the metals are present in a form that is toxic to fish, particularly trout. Humans can also be affected if the toxic cocktail contaminates their drinking water. The LFVC will continue to work on mine reclamation projects as partnerships, projects and time becomes available to work on them.